You work 40 hours a week, have commitments every Monday and Thursday evening, and a family to attend to every day of the week. Is it possible to follow the rules for lunar gardening when you’re limited to weekend gardening? The first and most important idea behind lunar gardening is to use the waxing and waning phases as your guide. These are the only two rules to follow. You won’t even need an almanac or calendar. Your guide is in the sky. Plant annuals and all “crops” that produce their bounty above the ground in the waxing phase, the two weeks between the New Moon and the Full Moon. Your crop may be one tomato or moon flower plant, a container of summer annuals, or a field of squash and peas. “Above ground” means that we can easily see what the plant produces. 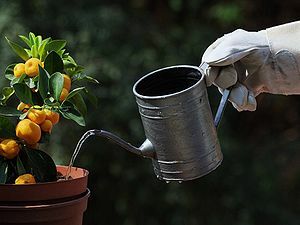 We start from scratch with these plants, either through planting seeds or buying new plants each season to transplant into the ground or containers. Petunias in the summer, pansies for the winter, seasonal veggies, and most herbs are examples of above ground crops. If your climate is warm enough, some annuals may survive several seasons. I transplanted some snapdragons three or four years ago that have bloomed through every season. They’ve long outlived their expected life cycle. Plant crops that produce their bounty below ground during the waning phase, the 2-week period from the Full Moon to the New Moon. “Below ground” is a bit confusing because we see flowers and foliage above ground with these plants. What classifies them as below ground crops is that they grow from the same root year after year, unlike annuals that have a one-season life cycle. (Usually, that is, unless your climate is very warm.) Day-lilies, asparagus, carnations, amaryllis, berries, shrubs, and trees are a few examples. These are the biennials and perennials in your yard and garden, on your deck or driveway. Biennials have a 2-year life cycle. They start from seed, producing their flowers and seeds in their second year. Foxglove, parsley, and black-eyed susan are biennials. Biennial seeds should be planted every year to have a constant succession of blooms each season. Perennials have longer life spans. Trees are the best example, but daffodils, dusty miller, ferns, chives, and raspberries are perennials, too. Your climate can change annuals to perennials or vice versa. Get to know your hardiness zone well. If all you can manage is to garden with the waxing and waning phases, you are doing exactly what millions of people have done successfully for many hundreds of years. And that means that you’re doing it right. Very interesting, CJ. I wonder if I was wise to plant my potatoes last weekend. I put in my snap peas too, so I got one of them wrong…. “Planting by the signs is not intended to replace common-sense methods of gardening ~ but correct planting dates, used in conjunction with such methods, will greatly increase the fruits of our labor. Why not do a test? If you plan on planting more, plant them in the waning phase. Waning Taurus is great for potatoes, btw. If you’d like those dates, let me knw. Yes, please! Looks like the taters are up and thriving, as are the peas. But I have not planted tomatoes or eggplant yet because it has been so chilly here. I am also waiting to plant my zinnias and tithonia, so dates would be helpful. Hi, dn. Sorry for the delay in responding. Best dates for annuals of all kinds is from New Moon to Full Moon. The next New Moon is June 8th. The best dates within that period are June 9th, 12:17pm through the 11th, when the moon is in Cancer, the most fertile sign. Next best for flowers is June 17-18, when the moon is in Libra, and the 18th – 20th, with the moon in Scorpio. I tend to plant whenever with best intentions, but I do plan this year to plant my two pots with impatiens during a waxing phase. You have impatiens? If you don’t have them yet, they may be hard to find this year. I tend to plant whenever with best intentions, but I plan this year to plant my two pots with impatiens during a waxing phase. Sorry to have posted twice. I haven’t looked yet. Am I too late? No, not too late. The impatiens have a virus and they’re very hard to find. The ones you can find probably won’t last long. It’s best to choose something else this year. Maybe you’ll have some volunteers from last year pop up.